PITTSBURGH — (BUSINESS WIRE) — June 30, 2014 — Cell biologists have a new imaging and analysis software available to them that offers speed, flexibility and efficiency for large-scale, high-throughput biology, including complex morphological analyses of cells, cell structure, and aggregations of cells in colonies. While robust, the platform is also simple enough to be applied to everyday assays such as viability and proliferation. The new Thermo Scientific CeLLInsight CX5 High Content Screening (HCS) Platform, a high-content quantitative imaging and analysis platform-powered by new Thermo Scientific HCS Studio 2.0 Cell Analysis Software, continues to advance technologies and options for single cell analysis across Thermo Scientific’s broad high content analysis portfolio. Adding Near-IR (infrared) capability to the CeLLInsight CX5 HCS Platform, the system is now enabled with true five-color spectral illumination, allowing access to a greater range of fluorescent reagents. Seven new validated assays were added to the platform, as well as the capability to accept images for analysis in many different formats. 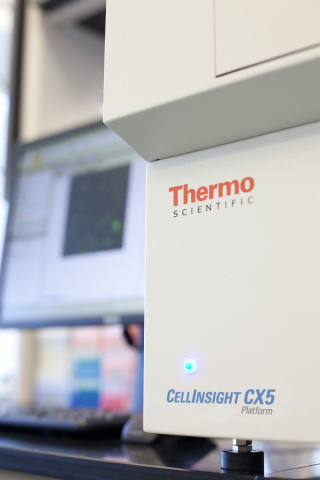 For more information on the Thermo Scientific cell imaging and analysis product family, visit www.thermoscientific.com/highcontent. Thermo Fisher Scientific Inc. is the world leader in serving science, with revenues of $17 billion and 50,000 employees in 50 countries. Our mission is to enable our customers to make the world healthier, cleaner and safer. We help our customers accelerate life sciences research, solve complex analytical challenges, improve patient diagnostics and increase laboratory productivity. Through our four premier brands – Thermo Scientific, Life Technologies, Fisher Scientific and Unity Lab Services – we offer an unmatched combination of innovative technologies, purchasing convenience and comprehensive support. For more information, please visit www.thermofisher.com.